Asymmetric stacking adds interest and appeal to this Sub-Zero Showroom Wolf Gourmet Appliances presentation. Staggering also allows the first-level toaster to side-step the taller counter-top blender. 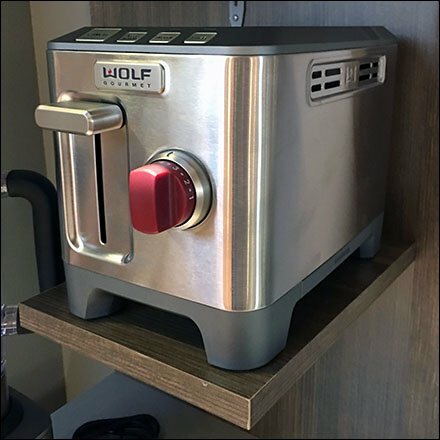 The counter-top appliance displays cross sells to Wolf Gourmet Cookware and Cutlery, out of frame to the right. Consider the individual offerings in the Wolf Gourmet Cookware gallery of images. Seen at the Sub-Zero / Wolf Showroom in Pine Brook, New Jersey.